Hosni Mubarak was thrust by violence into the leadership of the Arab world's most populous country, and was forced out by a wave of popular protest. Stability had been the watchword of his presidency, with emergency law - which prevented gatherings of more than five people - lasting throughout the 30 years of his rule. But in January 2011, inspired by the revolution in Tunisia, Egypt erupted in unprecedented protest. The country saw weeks of sustained demonstrations by protesters frustrated by poverty, corruption, unemployment and autocratic rule. 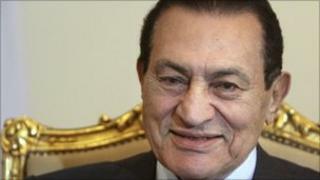 In a televised address on 1 February, Mr Mubarak announced he had decided not to stand for re-election in September. But protesters were demanding nothing less than the resignation of one of the Arab world's longest-serving rulers. And they have now got their way. Muhammad Hosni Sayyid Mubarak was born on 4 May 1928 in a small village in the Nile Delta. Despite a poor background, he graduated from Egypt's Military Academy in 1949 before transferring to the Air Force where he was commissioned in 1950. As Commander of the Egyptian Air Force and Deputy Minister of Defence, he was instrumental in planning the surprise attack on Israeli forces occupying Egypt's Sinai peninsula at the start of the 1973 Yom Kippur war. His reward came two years later when President Sadat, under pressure to appoint a deputy, made Mr Mubarak vice-president. He was elevated to the presidency in the wake of Anwar Sadat's assassination in 1981. Few expected that the little-known vice-president would hold on to the country's top job for so long. Despite having little popular appeal or international profile at the time, Mr Mubarak used his sponsorship of the issue behind Sadat's killing - peace with Israel - to build up his reputation as an international statesman. He was intimately involved in negotiating the Camp David peace agreement with Israel, signed in 1979 by Sadat and the Israeli prime minister, Menachem Begin. It cemented his relations with the US, which supplied the country with billions of dollars of military aid. To the West, Egypt was a key ally - a voice of moderation on the Israeli-Palestinian conflict. However, his position earned him the ire of Islamist extremists. The government argued that its draconian regime was necessary to combat Islamist terrorism. Mr Mubarak survived at least six assassination attempts. The narrowest escape was in 1995 when his limousine came under attack in the Ethiopian capital, Addis Ababa, where he was attending an African summit. Members of the largest opposition group, the Muslim Brotherhood, were frequently put in jail, where torture was common. The intelligence services were pervasive and Egyptians felt stripped of dignity. Criticism from human rights groups was routine. Mr Mubarak presided over a period of domestic stability and economic development that meant most of his fellow countrymen accepted his monopolisation of power in Egypt. But in recent years, he felt for the first time the pressure to encourage democracy, both from within Egypt and from the United States. After weeks of mounting protests, and few political concessions, that pressure became unbearable. The support of the military eventually dissipated, and the commander-in-chief left office. By 10 February reports that he was about to resign had swept through Egypt and around the world. In one further televised address Mr Mubarak frustrated the protesters again, insisting he would stay on until elections due in September. Less than 24 hours later, though, Mr Mubarak had left Cairo with his family, and newly-installed Vice-President Omar Suleiman appeared on state TV to announce that the president was standing down. Those filling the streets of Cairo, Alexandria and other towns and cities across Egypt erupted in joy as Hosni Mubarak slipped into history.